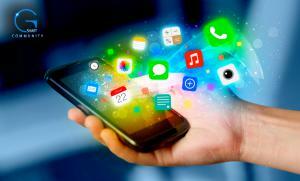 Mobile Apps Drive the Markets by Modern Consumers, Says G Smart Community. NEW YORK, USA, October 21, 2018 /EINPresswire.com/ -- Mobile APPs have become an essential part of businesses nowadays. They not only make companies look tech savvy but also provide a convenience to consumers when developed correctly. They can be a core component for multi-billion enterprises or simply just there to show “we have an APP”. The emergence of mobile APPs certainly changed the way we operated our everyday lives. The G Smart Community is an enterprise that uses blockchain technology to enrich lives through interaction. While the novel idea may seem unconventional at first, the launch of their G Smart APP suggests that it is actually quite interesting and simple. The G Smart APP is an open source blockchain underlying system that provides a rich interface for businesses, at the same time allowing community members to enjoy the vast functions made possible by the blockchain applications. The G Smart APP is characterized by the ability to implement smart contracts. Once the smart contract is established, it can be executed automatically without the involvement of an intermediary, and no one can stop its execution. The G Smart APP not only displays the live price of the ETH but also encompasses a myriad of other functions as well. It also allows you to transfer your benefits directly through the APP itself, making it possible to create transactions instantaneously everywhere you go, without having to flip your bulky laptop out. With the ease of mobile APPs, laptops and “.com”s become so passé. You can upload adverts and videos when you want, and it even has an online shopping platform integrated within! It also has an e-wallet function and a QR code scanner to make transactions even smoother. So mobile APPs are really a driving force for businesses nowadays. They provide more functions as compared to websites which provide basically more info. On top of that, they provide the ease of use which every business and consumer needs to make every deal that much faster, easier and convenient. G Smart Community expects ETH price to rise again, as do other tech experts.